Even as a youngster delivering newspapers and cutting grass, Ted had a good head for business. His father’s furniture restoration hobby piqued Ted’s interest in developing a viable antiques business. After earning a business degree from James Madison University, in Harrisonburg, VA, he was ready to get started. 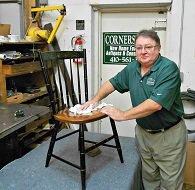 In 1986, he opened Cornerstone Antiques which evolved into Cornerstone: Antiques – Consignments – New Home Furnishings. Ted’s keen business sense, commitment to providing quality merchandise, and dedication to customer satisfaction have made Cornerstone the area’s premier home furnishings store. He now lives near York, Pennsylvania with his wife, Mary, and their four daughters. A second generation antiques dealer in the business for 30 years, Beth brings a wealth of experience to Cornerstone where she manages consignments of silver, glass, china, porcelain, rugs, furniture and so much more. 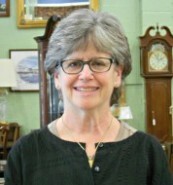 With her love of research and years of buying and selling “smalls” and furniture, she has developed a broad and comprehensive knowledge base. Beth’s insight makes her a valuable resource for Cornerstone consignors and shoppers alike. A long time Baltimore resident, Alex came to us after graduating Dulaney High School and before his freshman year in college. He joined our delivery team where he quickly took charge and became our “go to” guy. In 2009 he became our Floor and Delivery Supervisor, where he oversaw the Prep, Placement and Delivery of both the New and Consignment Furniture. In 2012 he took on his current role, where he plays a vital part in the day to day management of the store. 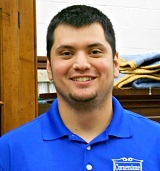 Alex’s hard work ethic and agreeable nature assures all of our customers a great experience before and after the sale. Arnold joined the Cornerstone Team in 2013 to oversee our Workshop as well as to assist with deliveries. In less than 3 years, Arnold has taken on the primary role of supervising deliveries while still assisting in the Workshop and other areas of the store. 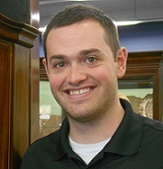 Originally from Texas, customers are reassured by Arnold’s laid back style as he makes sure your furniture arrives safely and is placed perfectly in your home! It takes many hands to bring beautiful antiques and previously owned furniture to our showroom floor. The skilled hands of our talented Prep Team are essential. Fortunately, Bill and Arnold are not afraid to roll up their sleeves and get those hands dirty. They insure that every piece of consignment furniture is ready to be placed in your home. No other consignment store in Baltimore prepares furniture like we do. Cornerstone’s trained delivery team knows how to protect and transport your furniture. Just another way that Cornerstone separates itself from other Baltimore consignment shops. Whether you’re sending pieces in to be sold, or bringing home your new prized possessions, our team of delivery specialists can get the job done for one flat rate- no matter how many pieces.